So The Legal Genealogist continues the task of poking around in old Arizona statutes in anticipation of Saturday’s 2019 Seminar of the West Valley Genealogical Society. I know, I know… it’s a tough job leaving the east coast ice and snow behind to head off to spring-like temperatures, but somebody has to do it. And I was about to turn the page when it hit me. What exactly is the difference between and among those three? So when that First Legislative Assembly decided to require all grants and deeds for lands within the Territory to be recorded in the office of the recorder of the county in which they were located6 — for which genealogists can be eternally grateful — that was a public act. And when it granted Elliott Coues a divorce from his wife Sarah Richardson because “there is no law of divorce existing in this Territory,”7 that was a private act. 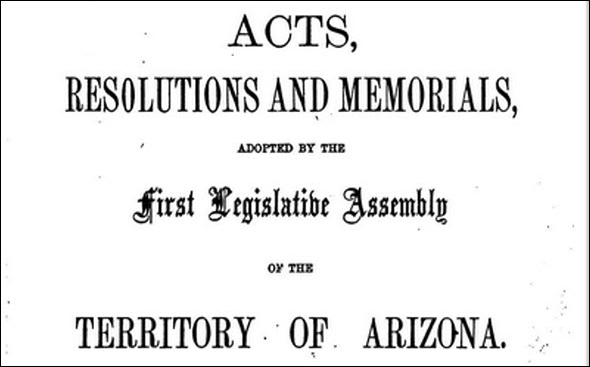 So when that First Legislative Assembly wanted Congress to pass an act taking land from the State of California and annexing it to the Territory of Arizona — and asking California to go along with the idea — to provide the territory with a commercial landing-place on the lower Colorado River,11 that was a memorial. Cite/link to this post: Judy G. Russell, “The difference in the laws,” The Legal Genealogist (https://www.legalgenealogist.com/blog : posted 13 Feb 2019).